Do any of you accomplished competition shooters use the subject seating die? The price is scary but I wonder if it works on loaded cases to ensure concentricity. I'm using a Lee undersize die to eliminate crimp jump in my 986 and get a case bulge where the bullet (HAP .355) is seated, sometimes a 360 deg. bulge but most often a 270 deg. bulge indicating an axis misalignment with the RCBS seating die. I am using the "RN" seating punch recommended by RCBS for HAP's. Just wondering if the Redding die is worth the $80+ and if it would ensure good concentricity. Thanks for any comments and suggestions. My .02 is for you to quit using the undersize die. Your creating your own problem when putting the .355 bullet in that case. I use Lee standard sizing die and with that same bullet have no/very little case bulge. Like I said that is my opinion. You can see where the bullet is in the case using the standard sizing die. You can also see that if the case was sized any smaller the bulge would be much more noticeable. I suspect (not tested) that sizing smaller would also lengthen the case. The redding competition seating die for 9mm is excellent, you get what you pay for in terms of quality. However, if you want a cheaper (and almost better) version of the same thing, buy a hornady 'new dimension' seater die and add a micrometer seating stem. The N.D. dies (as opposed to old hornady dies) have a collar that slides down and straightens bullet before the seating operation begins. I drop bullets in the case with minimal attention to straightness and never have any shaved lead or jacket. You can buy the micrometer seating stems from academy for $20. I also second getting rid of the undersize die. They are nothing but trouble for accurate loads, and that's whats causing your bulge, not the seating die. 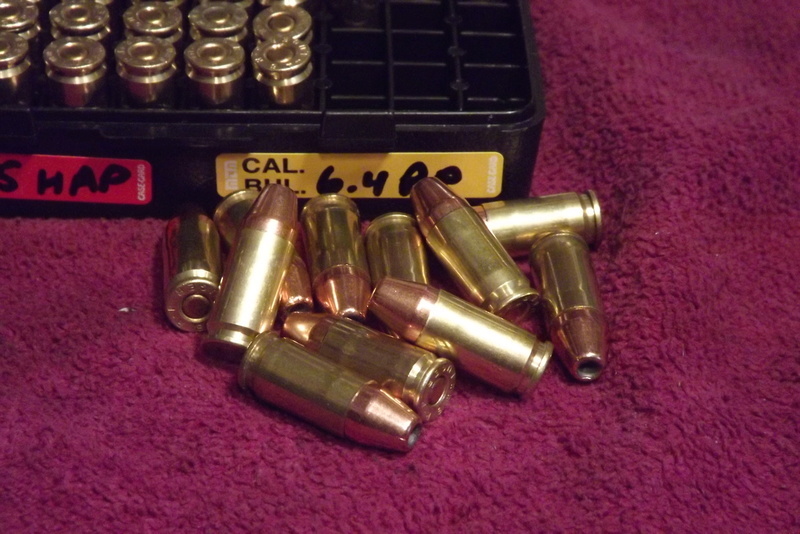 For .45acp use a .45 colt die and that eliminates the bulge.